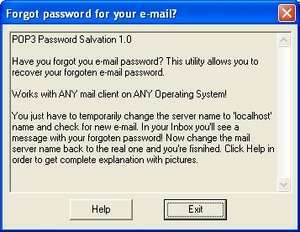 Softlakecity's pop3 Email Password Recovery was software which helped retrieve lost and forgotten email passwords with clients such as Microsoft's Outlook and Outlook Express, The Bat, Eudora and more. At this time, it appears the the developer is offline and there are currently no download links available. Have your forgoten your e-mail password? For security reasons, you should also check out the Email Password Recovery (pop3) download at LO4D.com which includes virus and malware tests. Additional screenshots of this application download may be available, too. 4.45 out of 5 based on 9 ratings. Email Password Recovery (pop3) has a presence on social networks.